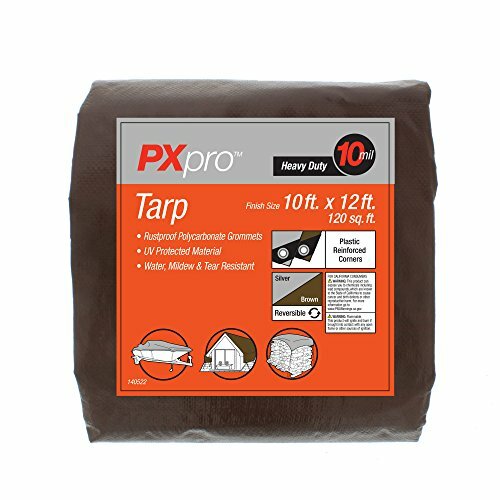 No matter how big or small, how simple or heavy duty the task at hand is, PXpro has a tarp to fit your needs. With everything from light duty to heavy duty tarps ranging in size from 6' x 8' to 20 ' x 40' these tarps always have you covered. All the PXpro Tarps are designed to combat water, mildew, and even UV rays which is perfect for protecting your belongings both inside and out. They're even tear resistant, so they can be used over items with edges or on heavy traffic floors. The PXpro Tarps come standard with grommets, making them easy to secure in place. Perfect for outdoor storage or camping just use some stakes or string to hold them down. The Medium and Heavy Duty Tarps even feature reinforced corners for extra security. PXpro is a new Paint Applicator brand for that features superior quality paired with great value. Our complete line of brushes, roller covers, tarps, and paint kits are perfect for both the professional contractor and DIY homeowner alike. Package contains (1) PXpro Tarp. Features grommets. UV protected material. Water, mildew, and tear resistant. A DESIGN FOR EVERYONE: No matter how big or small, how simple or heavy duty the task at hand is, PXpro has a tarp to fit your needs. With everything from light duty to heavy duty tarps ranging in size from 6' x 8' to 20 ' x 40' these tarps always have you covered. ULTIMATE IN PROTECTION: All the PXpro Tarps are designed to combat water, mildew, and even UV rays which is perfect for protecting your belongings both inside and out. They're even tear resistant, so they can be used over items with edges or on heavy traffic floors. EASY TO SECURE: The PXpro Tarps come standard with grommets, making them easy to secure in place. Perfect for outdoor storage or camping just use some stakes or string to hold them down. The Medium and Heavy Duty Tarps even feature reinforced corners for extra security. PAINT PRODUCTS FOR EVERYONE: PXpro is a new Paint Applicator brand for that features superior quality paired with great value. Our complete line of brushes, roller covers, tarps, and paint kits are perfect for both the professional contractor and DIY homeowner alike. PRODUCT SPECIFICATIONS: Package contains (1) PXpro Heavy Duty Tarp - 10' x 12'. 10 Mil. 160 GSM. Rustproof polycarbonate grommets. UV protected material. Water, mildew, and tear resistant. Plastic reinforced corners. Brown/silver reversible cover. If you have any questions about this product by PXpro, contact us by completing and submitting the form below. If you are looking for a specif part number, please include it with your message. Progrip 3104 Medium Duty E-Track Ratchet Tie Down with Webbing Strap: Snap Hook Ending, 7' x 2"